Mehr als nur Tango, Astrid Mayerle. 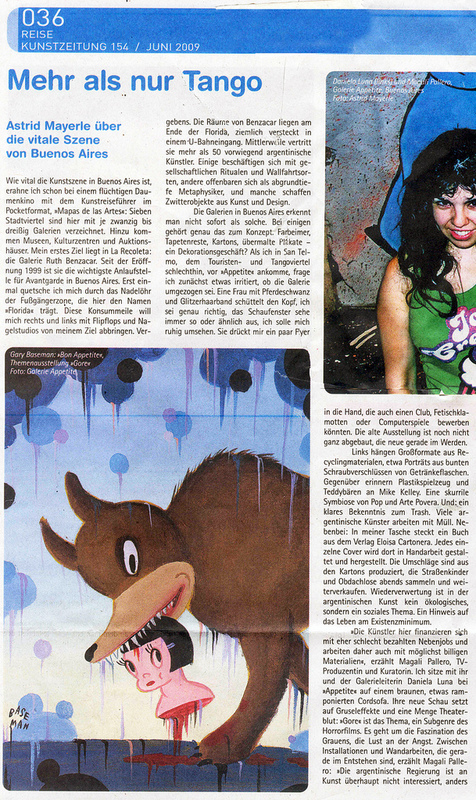 In: „Kunstzeitung“, Nr.145: Regensburg, Juni 2009. I don’t have this magazine, too bad!! The picture of me and my friend Magali Pallero, curator of the exhibition Gore that was at my gallery APPETITE on 2008, was taken by Stefania Fumo (www.girlontape.com). The painting on the first page is by Gary Baseman, an really cool artist from LA that was part of the exhibition. And then something very funny happened with this pic, as published by another magazine: “Artist Herman Schouwenburg’s drawing based on Stefania Fumo’s photo of curator Magalí Pallero and gallerist Daniela Luna in the opening of “GORE” show in Appetite Gallery, which he saw in art paper Kunstzeitung in a Rotterdam museum, is now on exhibit in a gallery in the same city…” That’s the picture on the bottom.